There’s no present like time. I know, it’s backwards. But it makes a point. This reversal of the famous “no time like the present” is a reminder that time is precious—something you can’t get back once it’s spent. So, you have to make the most of time you have, whether you’re building friendships, making memories with family, pursuing your dreams, or working toward goals. And that’s especially true when it comes to saving for retirement. When it comes to building wealth, you need three things: money, time and compound interest. Now, you might think money is the most important factor—but it’s not. The most critical element of the investing formula is time. 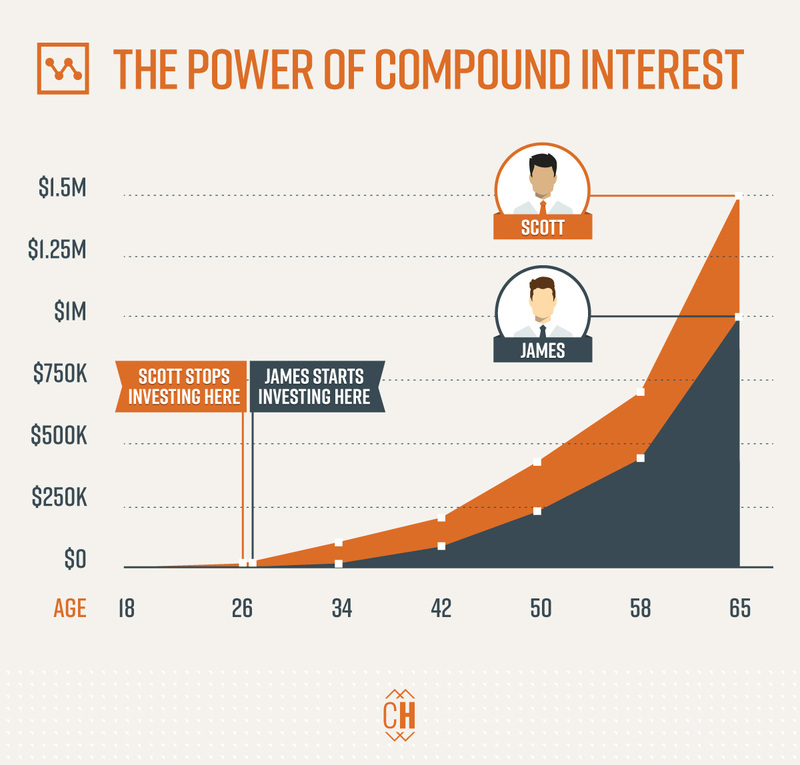 The more you have, the more compound interest can grow. That’s why you need to start investing now. Not when you have a better job. Not when you hit your 30s or 40s. Not when the market is better. NOW. Don’t think time matters? Let’s look at the story of two friends, Scott and James. Both of them knew the importance of thinking about the future. When Scott got his first job at age 18, he began investing $2,500 a year. He continued until age 27, for a total of $22,500. James on the other hand invested $2,500 a year from age 27 to 65, for a total of $97,500. They each got a return rate of 10%. When they both retired at age 65, who do you think had more in his investment account—Scott with his total contribution of $22,500 or James with his contribution of $97,500? James invested more, but Scott had more money in the end—over $425,000 more! How is that possible? Scott started earlier than James, which gave time and compound interest the opportunity to work their magic. The key is to start investing as soon as possible. What Should I Do Before I Start Saving for Retirement? Yes, I want you to start investing for retirement as soon as you can. But there are a few things that come first. If you don’t take care of these, you’re not making your money work for you. Get an emergency fund. Start with $1,000 in the bank. Then, once you’re debt-free (except the mortgage), save three to six months of expenses. When you have that in place, don’t touch it unless it’s an emergency—and a new wardrobe doesn’t count. Get rid of debt. Debt is retirement quicksand. You can’t charge forward with investing if your money is going toward debt payments. So, set your sights on saying goodbye to Sallie Mae and the Visa card before you start investing. Can you imagine how much you could be putting in retirement if you didn’t have monthly car payments? Wow! Get on a budget. Seriously, if you’re not doing a monthly budget, start now. Do not pass go, do not collect $200. Without a budget, you’ll spend your money on your wants instead of your needs. A budget gives you guardrails for where your money should go. Once you’ve tackled these three tasks, you’re ready to start investing. Congratulations! You’re already ahead of a majority of Americans who have little or no savings. (1) Now it’s time to build wealth for the future! How Do I Get Started Investing for Retirement? Listen up: You need to invest 15% of your monthly income. That amount still leaves room in your budget to save for the kids’ college fund and pay off the mortgage. If you can’t invest 15%, put away as much as you can and work toward increasing the percentage as your income grows. To open a retirement fund, first check with the HR department at your workplace to see if your company offers a 401(k) program for employees—and if they’ll match a percentage of your contributions. If you have that option, take it! Contribute up to the company match. Otherwise you’re leaving free money on the table. Then, put the rest in a Roth IRA, up to $5,500 a year (or $6,500 if you’re 50 or older). To open a Roth IRA or another investing option, talk with a financial advisor. These folks know the financial world inside and out and can help you reach your financial goals. Work with someone who will answer your questions, explain your choices, and allow you to make the decisions about your retirement fund. If you don’t have an advisor yet, check out a SmartVestor Pro. There’s no time like the present. And there’s no present like time—so get to work! Just enter your information, and you’ll get a list of SmartVestor pros in your area who can help you plan and work towards your financial goals.